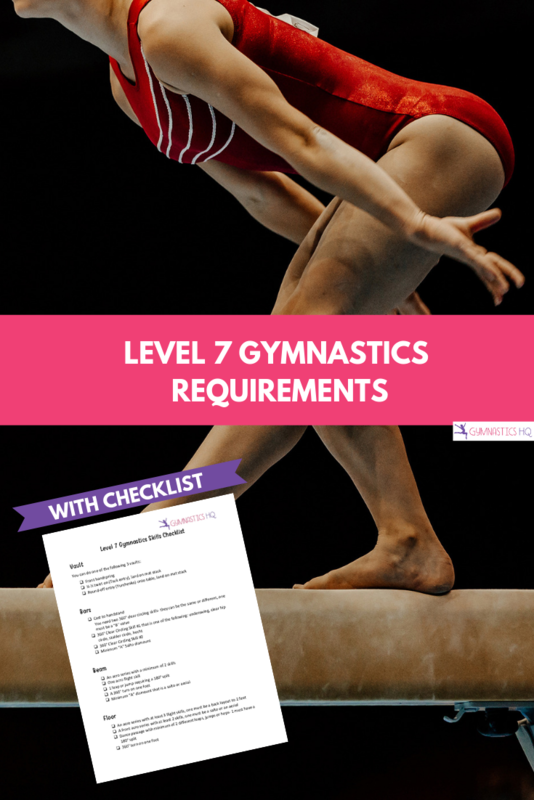 Here are the updated level 7 gymnastics requirements that will come into effect on August 1, 2018. Information for other gymnastics levels can be found here. To compete in level 7 gymnastics, a gymnast must be able to do the following skills on each of the four events. 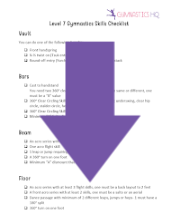 In addition to the skills listed below, level 7 routines must each have 5 “A” skills and 2 “B” skills. In gymnastics each skill has a value, A’s are the easiest all the way up to E’s, which are the hardest. So when the choreographer is choreographing the routine, he or she will need to make sure to add the right amount of skills and difficulty. Once a gymnast can perform all of these skills and she has passed out of level 6 she can compete in a level 7 meet. And after successfully completing level 7, she can compete level 8. If someone was a level 6 in 2012 and scored higher than a 32, can they go straight to level 7, or do they have to do the level 6 optional first? Because the levels are changing, for this year the gymnast can either choose to compete level 6 optional or level 7. Can a level 7 do more than 2 b skills? Can they do more b’s and they count as A skills? can a gymnast who has met the required score last season in the old level 5 compete one meet the new level 5 and then test out to go to the new level 6 optional? Yes, She may mobilize out of the new level 5 to compete level 6 optional as long as she obtains a minimum 31 all-around score. Is the beam compulsory for men? We got a couple of balls to worry about. Can a person just skip tumbling on a beam like girls do and promote to upper levels. The beam is not a mens event. Is 2 back handspring step outs in a row more impresssive than tic toc back handspring step out for points? If a gymnast has a more difficult routine, would her chance of winning be higher? If a gymnsat doesn’t have the most diffiuclt routine on the team, then she is positioned not to win, at least within this team. Is that a fair statement? Is 2 back handspring step outs in a row more impresssive than tic toc back handspring step out on beam for points? Are these good elements for level 7 beam? If a gymnast has a more difficult routine, would her chance of winning be higher? If a gymnast doesn’t have the most difficult routine on the team, then she is positioned not to win, at least within this team. Is that a fair statement? I’m having trouble coming up with 5 “A” and 2″B” skills in addition to the requirements for floor, beam, and bars. It would be greatly appreciated if you could make a list of extra skills for each of these events along with there values. I’m having a bit of trouble coming up with the 5 “A” and 2 “B” skills for bars, beam, and floor. It would be greatly appreciated if you could possibly make a list of extra skills for each of these events. I am a level 7. 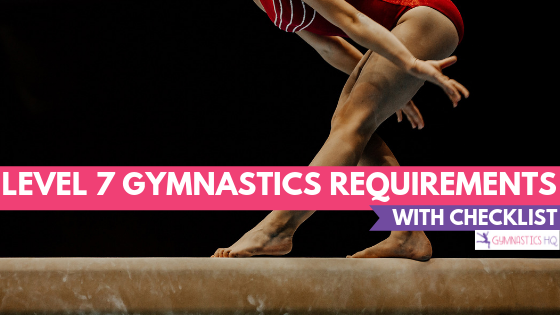 Can you do more than a front handspring on vault? And on beam can you do a backwalkover-backwalkover and a backhandspring separately? Thanks! For level 7 floor could you do a front hand spring step out round-off layout instead of the round-off backhandspring layout. Am I allowed to have a mat on the floor to land on when I compete a level 7 floor routine? My gym doesn’t have anything After xcel platinum, it just goes back to levels. So what level would you be after xcel plantinum? Can an xcel gold gymnast transfer to JO level 6? You would need to compete at least one meet each as a level 4 and 5 and have qualifying scores of 31 AA. Is this the same for Australian levels? If you have already competed level 4 and scored out of it, then yes you can go compete level 5. Can you replace A skills with B skills? Is a clear hip circle a B skill on bars? Thank you, I really like the checklist! I was wondering, does a gymnast have to score out of level 6 to compete level 7? I was a level 4 a few years ago and then went on to compete level 7 the next year. Is that allowed? I had all the requirements for level 7 and had scored over a 31 AA o level 4. I am pretty sure I was supposed to compete at least one meet at level 5 but I’m not positive. How much is it to join mate? Where can you find a list of element difficulties? Example – list of “B” valued skills on beam. You have to compete at least one level 5 meet and score at least 32AA to skip level 6 and move on to level 7. Keep in mind having a skill and skill perfection are two completely different things. Good luck! So can you skip 7 and go straight to 8 if you have all your 7 skills? 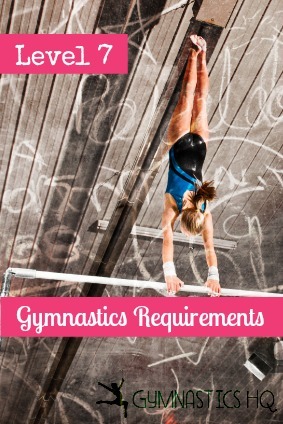 Does USAG levels 6-10 allow for individual event specialists? My daughter loves the floor but is thinking of quitting because she no longer wants to compete on beam and bars…. No USAG levels don’t let you compete as an event specalist, but Xcel levels will let you! I have a level 7 who is really nervous about bars since her neck injury. She will do baby giants on the low bar but is really scared to do them on the high bar. Can compete the baby giants on the low bar and still and free hip on the HB and still meet all her requirements? how do i get a split on the wall? i am in level 3 and i can do the splits, split jump almost and a handstand with the splits, but i cannot do them on a wall! how do i get there? hi I am not sure what level I would be in because on a trampoline I can do a front tuck, front layout, and a front handspring but on mats I can only do a handstand, cartwheel, and round off. My daughter competing level 7 this year if she does a stoop on low bar is that considered as one of her clear hip circling elements. Is a tick tock back handspring considered a lower skill or harder than a back walk over back handspring?